Posted on Sun, Jan 15, 2012 : 5:59 a.m.
Livonia resident John Brink tries his luck on an Internet sweepstake game at the 3 of Diamond Internet Cafe. On a recent evening, John Brink sat in front of a large computer monitor at the 3 of Diamonds Internet Cafe on Eisenhower Parkway in Ann Arbor playing an Internet sweepstakes game. The game, "Soda Pop," resembles a casino-style video slot machine that lines up bottle caps for players to win points. Brink “wasn’t having a lucky night," but he is a regular at 3 of Diamonds and previously won $150 in one sitting. The business' owners say it's not gambling. Instead, they say Brink is playing a sweepstakes game at an Internet sweepstakes cafe. Unlike gambling and games at casinos, they said there is no chance involved at 3 of Diamonds — and that anyone can play for free. The cafe is one of about a dozen Internet sweepstakes cafes that have popped up throughout southeast Michigan over the last year. Brink said he prefers sweepstakes games and 3 of Diamonds to gambling at a casino. But a new brochure issued by the Michigan Attorney General's Office says the sweepstakes operations are of questionable legality. Mike Bergen, owner of 3 of Diamonds, emphasizes that the sweepstakes games are not another form of gambling — a point underscored by multiple signs posted throughout the business in the Colonnade shopping center. Here's how it works: When customers visit 3 of Diamonds, they purchase a phone card that is good for calls anywhere in the world. Customers receive a set amount of “sweepstake points” as a promotional giveaway with the phone card. At 3 of Diamonds, a $25 phone card will get a customer 3,000 sweepstake points. Those points are then used to play a game, which can resemble slot machines, dice or keno based games. When a player “spins” on any turn on any of the games, they are given an electronic ticket with 10-digit number that appears somewhere on the computer screen. That number is supplied by the software company that produces the games for 3 of Diamonds, and it is already predetermined to be a winning number or losing number. Winning ticket numbers already have a predetermined "win point" value, and the software then generates a winning “spin” that will give the player "win points," which can be cashed out for money. If, for example, Brink received a ticket number on Soda Pop that had a win point value of $50, the software on the computer would line up the bottle caps in such a way that he wins $50. But those bottle caps lining up wasn’t chance - the computer was programmed to line them up in the winning order because of the predetermined winning ticket number. Because no purchase is required for sweepstakes, 3 of Diamonds will give customers 100 free sweepstake points if they ask. But, at the end of the day, people are putting down money to win money. So isn’t that gambling? 3 of Diamonds Internet Cafe. Bergen says no, and likens it to playing sweepstakes games at McDonald's, where tabs are pulled off packaging to reveal if that product is a winner or not. “You could go buy 200 McDonald’s Happy Meals to play their Monopoly game. Is that gambling?” Bergen asked. Bergen contends his business pays income tax on its earnings, pays sales tax on the phone cards it sells and is governed by sweepstakes laws, so he doesn’t see any need for additional governmental regulation. Assistant State Attorney General Don McGehee oversees gaming issues for the attorney general's office. He did not respond to AnnArbor.com questions, but recently issued a new Internet sweepstakes cafe guide. The brochure from the AG's office stated that Internet sweepstakes cafes offer "games of chance" for customers to play for a fee. "These establishments may be run under the false premise they are conducting legal promotional sweepstakes, but there is no such exception for this type of gaming under Michigan law," the brochure reads. It says sweepstakes are not defined under Michigan law, but there is an exception for promotional activity that is narrow and requires a sweepstake to be "a promotional activity that is clearly occasional and ancillary to the primary business." Additionally, the requirement that a customer be present at the cafe to pay for Internet access to play a game makes it a lottery, not a sweepstakes, according to the AG's Office's statement. In the case of 3 of Diamonds, Bergen says his business is selling phone cards, and the rest is simply a promotional activity. 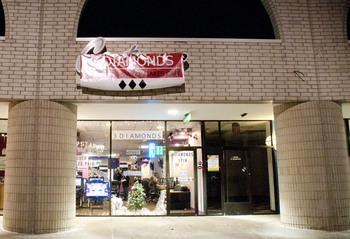 3 of Diamonds, which is located at 893 W. Eisenhower Parkway, leases the gaming software from Phone Sweeps, a company that provides sweepstakes software to cafes around the country. Phone Sweeps provides the games and ticket numbers for 3 of Diamonds, and Bergen has no control over the ticket numbers or even a choice in the games that are loaded onto the cafe's computers. Bergen said he first started thinking about opening a cafe after visiting them with his parents who live in Florida. Although customers can win money and 3 of Diamonds has distributed nearly $80,000 since September, Bergen said one of the reasons the cafe is so popular is because it doesn’t have a casino atmosphere. Its 25 monitors are spaced at comfortable distances from one another on large tables. There is no smoking, the noise level is significantly lower than at a casino and customers sit in large, cushioned chairs. No alcohol is served at 3 of Diamonds, but local ordinances allow the possibility to create a section where people can bring their own alcohol and play. Bergen said his cafe could go that route, but he said he wasn’t yet sure if it would. For now, the cafe offers free bags of chips, pretzels, pop and bottled water to customers. Although Michigan residents only have to be 13 years old to enter sweepstakes, you must be 18 to enter 3 of Diamonds. Mon, Jul 16, 2012 : 5:34 a.m.
Tue, Jan 17, 2012 : 1:06 a.m.
Why does the name Mike Bergen sound familiar to me? Isn't he a big shot in the local city govt? Mon, Jan 16, 2012 : 10:30 p.m. So, if they were legitimate, then people would be going there to buy phone cards, but instead they advertise as an Internet café/ casino. Nowhere on their ads do they mention phone cards. Also, if they are not regulated, that means they pay out whatever they decide to pay out. In real casinos, at least the state's gambling commission sets the slot machines odds. And if they are not regulated, does this infer that people of any age, let it be 21, 18, 15 or 5 or even 2 years old can go in an "play the games?" It's clearly gambling, so if we allow it, then we should regulate it. Mon, Jan 16, 2012 : 4:40 p.m. It should fall under the State's gaming rules so that the State of Michigan can inspect and verify that the 10-digit winning number is actually random and not rigged somehow. Or..if you trust some mystery number to appear on a screen and tell you that you're a winner, then that is your choice. I wouldn't take this place seriously. Mon, Jan 16, 2012 : 3:27 p.m. This reminds me of a story in the old Ann Arbor News years ago. The homeless people living under the Broadway bridge didn't call themselves &quot;homeless&quot;, they were &quot;Nomadic Urban Campers&quot;. This sounds a lot like gambling no matter what they call it. Mon, Jan 16, 2012 : 1:39 p.m. If it looks like a duck, quacks like a duck, it's probably a duck. It sounds like gambling to me. Mon, Jan 16, 2012 : 1:04 p.m.
Mon, Jan 16, 2012 : 12:59 p.m. Many replying here are getting caught in the legal technicalities the AG's office brought forth. You can ask the AG's question: is it legal? Or, you can ask the broader question, why should it be illegal? 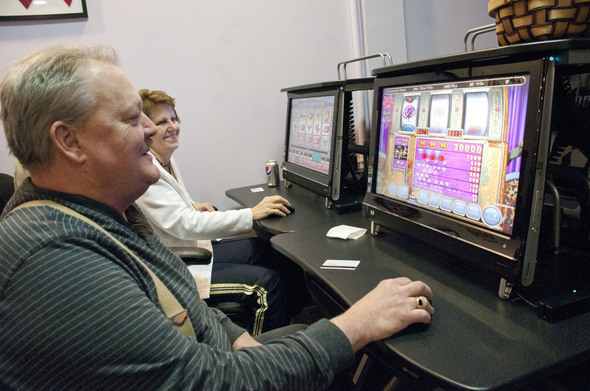 Bingo is a popular diversion across churches and non-profits across the State. The State runs a myriad of lottery games with big budget advertising--even calling it a wonderful Christmas gift. There are casinos run by the native Americans and, of course, Detroit's 3 sanctioned casinos. There's horse racing (although that's nearly dead) and, let's face facts, countless will participate in football pools all over come Super Bowl Sunday in a manner that, if you read the laws technically, probably would find many involved in illegal gambling. This business may have found a loophole. Bill Schuette doesn't think so. My question is why force this man out of business when he's selling entertainment no different than any I already cited that are considered legal? Instead, the Legislature should provide room for this and establish the regulations that will ensure that these businesses can prosper while giving municipalities the ability to regulate through zoning and hours of operation rules that will help to keep them clean and safe. A while back there was a big push for &quot;racinos&quot; at the racetracks. You could put these there and maybe save a few. I'm no gambler (waste of money, I rarely even buy lottery tickets unless urged to by my wife). But, when done legally, it's not a bad form of entertainment--whether you call it a sweepstakes or not. We crossed the moral line decades ago. The only reason to regulate it is to keep it from under the control of bad elements and to keep the places safe. I say it should be legalized. Mon, Jan 16, 2012 : 6:21 a.m.
Mon, Jan 16, 2012 : 1:44 a.m.
Sun, Jan 15, 2012 : 9:35 p.m. The phone card you buy is at $.03/min, so I would say this is comparable to the gas station or supermarket phone card. I don't see what the big issue is as long as they are paying taxes. Sun, Jan 15, 2012 : 7:36 p.m. The operator's analogy to McDonalds' Monopoly game is a good one. How is this different than buying product at McDonalds so you can get a ticket that may or may not win you cash? In both cases you have the opportunity to request a free ticket. It all seems like gambling to me. Sun, Jan 15, 2012 : 6:45 p.m.
Sun, Jan 15, 2012 : 6:44 p.m. Call it what you want, its a fun atmosphere and relaxing. I stopped in for a couple of days while i was christmas shopping and the staff was extremely friendly. I bought a 25 dollar phone card and was able to play games for a couple of hours on two separate days. In response to the one gentleman, i believe the rate on phone cards is 3 cents per minute. Also, if we shut these places down, then charity gaming (charity poker rooms, church bingo) will be next domino to fall. Sun, Jan 15, 2012 : 6:07 p.m. Slots are nothing more than a random number generator and so is this. Gambling is gambling. Sun, Jan 15, 2012 : 6:38 p.m.
No, it is not predetermined who will win in the slots. It is predetermined based on your ticket that it will. Similar to a raffle. Do you consider raffles gambling? If so, I want every kid who every charity that ever sold raffle tickets closed down and arrested for gaming. Sun, Jan 15, 2012 : 4:09 p.m. It's not gambling. It's a sweepstakes. Oh. Okay. Carry on. Does this also mean cocaine is not cocaine? It's just super happy fun time powder? Sun, Jan 15, 2012 : 2:31 p.m.
A silly waste of time. It's your money. I'd rather have a decent meal and a couple of cocktails at Knight's any day. Sun, Jan 15, 2012 : 2:21 p.m. If your money is at risk, it's gambling. But if advertisers are giving you an opportunity to &quot;win&quot; money for being exposed to their advertising. Then the only gamblers are the advertisers who are betting viewing the advertising will get you to buy the products you viewed. This is the same as driving down the road and reading the billboards. Sun, Jan 15, 2012 : 2:43 p.m.
&quot;If your money is at risk, it's gambling.&quot; Then why is the stock market legal? Sun, Jan 15, 2012 : 1:46 p.m. This is a business, which I assume has employees, and pays state and federal taxes. On top of that you have to assume that this business is paying a few thousand dollars a month in rent to the owner of the shopping center, and you are bringing people in from other cities that are spending money in our town, and most likely eating at Applebees next door. Given the current economic state of Michigan, I really don't see where this would be a problem. The only reason why this business is forced to operate under some kind of a ruse, as it appears, is because of the laws in this state. They seem to have no problem with this kind of business in Florida. Sun, Jan 15, 2012 : 9:13 p.m.
Sun, Jan 15, 2012 : 2:50 p.m.
Mr Brink happens to be employed by the City of Ann Arbor. So in a way our taxes are going to support this &quot;business&quot;. Sure, let's model ourselves after Florida. Sun, Jan 15, 2012 : 1:36 p.m. I wonder when Bill Schuette and the right wingers will investigate another gambling operation. It is called the stock market. You give your money to a company and they use that money to take a chance to win more money. In fact, that is EXACTLY what Rick Snyder did as a venture capitalist every single day. Of course he never would investigate a catholic church bingo night now would he? How is that any different? It is PURELY a game of chance. They aren't even giving you the phone card. Finally, there is that thing called the lottery (which this is really about) that puts the government in the gambling business. As long as the game is on the up and up, and it is a CHOICE, gambling should be allowed anywhere and everywhere. Allowing three casinos in Detroit seems to me to be picking a winner, and we know the right hates when government does that. Sun, Jan 15, 2012 : 12:36 p.m.
Give me a break. So I can't set up a slot machine where someone puts in a quarter and leaves chances of winning up to the machine. I can however sell them a key fob or collectible coaster for $25 which gives them a hundred pulls of the slot machine. I can't legally leave whether they win or not up to the random odds at the machine, but if I shift those odds to a predetermined code on their key fob which is randomly pulled from a basket, then it's okay. And just to make sure I meet the &quot;no purchase necessary&quot; sweepstakes clause, I'll give a free ticket with a predetermined win/loose code for one pull on the lever to anyone who asks (only one free &quot;sweepstakes&quot; entry per visit). But it's not a gambling establishment. No, really, we're just selling key fobs and coasters. Sun, Jan 15, 2012 : 11:50 a.m.
Are the rates/minutes on the phone card comparable to the rates/minutes on other phone cards for sale in the area, such as at gas stations? If the rates are competitive, then the sweepstakes might not be considered as gambling. I find this unlikely, however, because they do not give you free bags of chips, pretzels, pop, and bottled water when you go to Sprint or T-Mobil to refill your minutes. They also do not rent large spaces at their expense to allow you to enjoy yourself with Internet games. The money for these extra features has to come from somewhere - almost certainly, inflated rates for the phone cards. The gentleman compares himself to McDonald's when it runs a sweepstakes game. This is disingenuous because McDonald's prices for food are similar to those at Burger King, Taco Bell, etc., and they only run a sweepstakes once in a while. The Attorney General's office should investigate these types of businesses and proceed according to the law. Sun, Jan 15, 2012 : 11:49 a.m. It sounds entertaining for some. I would recommend the State consider making these kinds of operations clearly legal to help remove the fiction of buying a phone card. They aren't a competition for the true casinos and, with proper regulation and model zoning ordinances, can be no more offensive than a church bingo. I can see a lot of seniors who would enjoy this without having to travel far and it can bring in some tax revenues. Keep it clean, well-lit, like this place. I don't see this as being something the AG's office should be spending a lot of time on. A smart legislator would step in and sponsor some legislation on this. Bill Schuette's office needs to remain focused on the big crime stuff. Like all those dangerous pot houses that are undermining the welfare of sick people in pain simply because of some misguided law passed by the vote of the people. Sheesh! As if we knew what we were doing!. We don't understand all the ramifications to big pharma--I mean to citizens. If those pot houses take hold, then those poor people might not otherwise take something highly addictive and toxic but with a great profit potential to big pharma like oxycondin. We need to protect our pharmaceutical companies, er' I mean, ciitizens... Let's stay focused, Bill!